The ground floor bathroom has only the toilet and sink. On the first floor the Turquoise Room has an outside bathroom with shower, while the Double room has an en suite bathroom with bathtub. On the second floor, the Blue Room has an en suite bathroom with tub; the Yellow Room has an en suite bathroom with shower box; the Ethnic Room has a large external bathroom with bathtub and two sinks. The bedroom in the Casetta has an en suite bathroom with a shower box. Enclosed garden of about 1,000 sqm. Property with fields and Mediterranean scrub of 90 hectares. Smoking is allowed in the common areas. Smoking is forbidden in bedrooms, bathrooms and pool area. We will not be present during the rental period. In any case we will give you all the information you need upon your arrival and we will always be available if required. We speak Italian, English and French. Entry Day: Saturday (except in the Easter period). The deposit is € 1.000,00 and must be given in cash, when the house keys will be handed over. The cost of electricity and gas is to be calculated according to consumption and is deducted from the deposit. For stays of more than 7 nights, the change of towels and linen will cost € 10,00/person per week. The use of the swimming pool is NOT exclusive to the guests of the Casale, as any renters of the Dépendance will be allowed to use it. The pool is open from May until the end of September. The price indicates the rent of the Casale only. 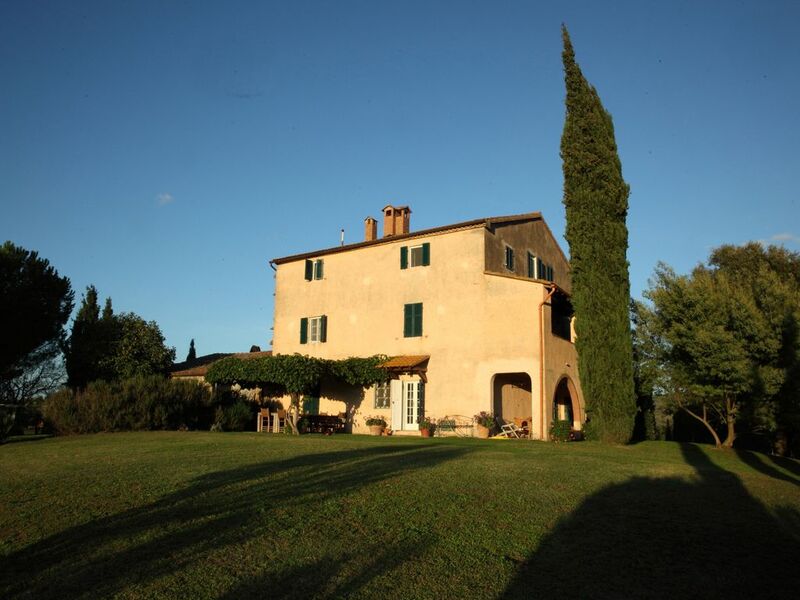 The Dépendance is a separate house from the Casale and is NOT included in the price. Service staff (cleaning, cook, babysitting) available as an extra on request. We had a wonderful time. Really such a lovely place. Emilio met Marty and was so generous with his time and knowledge. All we could talk about was When do we come back? The only problem is you don't leave the property and see the rest of Italy as much as you should! The house is marvelous - tactfully decorated (you can see the house is "lived" by its owners and not just a renting endeavor), with a charm that only history can bestow upon its walls, floors and corridors, and yet with all the comforts you need. Frankly, you sometime think, while gazing at the unpolluted night and stars, whether you need any other comfort! I am looking forward to my next stay there with great anticipation! Great destination for two families! We (7 adults and 3 children) had a wonderful stay in Podere Poggetti. We were warmly welcomed by the family, who gave us all the information we needed. The house is situated on top of a hill, surrounded by a big garden with pool, so that you have great views from everywhere around the house. The environment is quiet, but it doesn’t take much time to get to beautiful towns and beaches and nice restaurants. The information (photos and text) on the internet is correct; what you see is what you get. The house is very complete, both exterior and interior. The family has well taken care of it for a long time. We were very sorry that we had to leave after 2 weeks and would be glad if we could come back some time! Abbiamo passato il periodo di Pasqua in questo incantevole Casale, eravamo un gruppo di 10 persone con 3 bambini e abbiamo avuto un soggiorno davvero piacevole e rilassante! Il Casale, a conduzione familiare, è ben attrezzato di tutti i confort e dotato di tutto quello di cui avevamo bisogno. Le stanze sono molto accoglienti, arredate in modo semplice e con gusto. La posizione è meravigliosa perché si trova su una collina lontano da tutto. Si è proprio immersi nella natura e nella tranquillità del posto, ma allo stesso tempo però eravamo vicini al mare e a molti paesini deliziosi da visitare. Il punto forte di questa struttura infatti è proprio la versatilità del luogo, che ti permette di rilassarti a casa davanti al camino e di cucinare qualcosa nella cucina ben attrezzata oppure di esplorare i villaggi nei dintorni (Magliano, Scansano, Roselle e tanti altri) e i vigneti della Toscana, ma anche dopo una giornata fuori è una gioia tornare nel Casale e assaporare un buon bicchiere di vino al tramonto. Lo consiglio vivamente e non vedo l’ora di tornaci, nella stagione estiva per fare un tuffo nella piscina! Abbiamo soggiornato con i nostri tre figli di 7, 5 e 2 anni nonché con la nostra cucciola di taglia media e la nostra tata. Oltre a noi c'era un coppia di amici con due figli di 3 e 4 anni, una cucciola di taglia piccola e la loro tata. La proprietà è molto ampia e munita di un vasto e bellissimo giardino con diversi angoli in cui riposare anche al fresco. La piscina è perfetta per adulti e bambini. Nessun rumore da vicini o strade limitrofe. La casa è munita di tutti i confort, ben arredata e con locali e camere da letto ampie. Ciascuna camera è dotata di propria privacy. Sebbene la proprieta sia isolata, il centro urbano e le principali località turistiche sono raggiungibili facilmente e in breve tempo tramite strade per nulla trafficate. Siti, escursioni e borghi in località fantastiche, nella Maremma più vera ed autentica. Caldamente consigliato. Speriamo tutti di poterci tornare presto!!! When you are on the motorway Florence - Livorno - Grosseto, exit at Grosseto Sud. and then turn right towards Scansano. Follow the signs for Scansano, until the junction with the Poggio la Mozza sign. Turn right and after 10 km and 200 m in a bend to the right, to the left in the middle curve, take the dirt road leading to Poggetti. At the beginning of the dirt road there is a sign with the indicated 'Testa Paola - Podere Poggetti'. Casale Poggetti is located in the area of Poggio la Mozza, in the province of Magliano in Toscana, 15 km away from Grosseto. We are in the heart of the wonderful Maremma. Maremma is an area rich in sites of interest such as the Archeological Area of Roselle, the villages of Scansano, Magliano in Toscana and Montiano, all within 20 minutes by car. The Casale is 25 minutes drive from the beautiful Maremma Regional Park - Uccellina Park and from the sea. You can also enjoy a relaxing day at the famous natural baths of Saturnia, which are 40 km away. The cities of Siena and Florence are also very close, respectively 1 hour and 1 hour and 30 driving. The nearest airports are Pisa and Rome Fiumicino which are 2 hours drive. The car is necessary. Gas and electricity are not included in the rental price, they will be calculated at the end of the period based on consumption. The cottage is NOT included in the price of the farm, in the PHOTO GALLERY they are the latest. In summer periods when the pool is in operation it is required to sign a discharge of responsibility (mailing available, if requested) Service staff (cleaning, cook, babysitting) available as an extra upon request. Smoking is prohibited in the bedroom, bathrooms and pool area. The towels provided are for the exclusive use of the house and cannot be used in the pool or the sea. Pool towel is provided for each guest. Pets are allowed only on request, if educated and if they remain within the perimeter of the garden; a little extra is asked. The presence of wild cats is reported. The 900 € deposit must be given in cash upon delivery of the keys. Final cleaning included, for stays longer than 7 nights, for each week + € 130.